We're going back to our Delhi days when we couldn't stop frequenting this pretty store in CP, no matter how often we visited it. A colourful folksy setting accentuated with kitschy handwoven wall hangings, clothes and drapes, The Shop is a place you'd like to get lost in. And now that it has finally come to Kolkata (Sector 1, Salt Lake), we are not apologising for actually getting lost in it. You've got to be the sort to appreciate fine fabrics and Indian indigenous crafts to fully understand the magic of this place. Move beyond the run-of-the-mill styles and prints, and head to The Shop to check out some fantastic smart fashion, accessories and home decor. 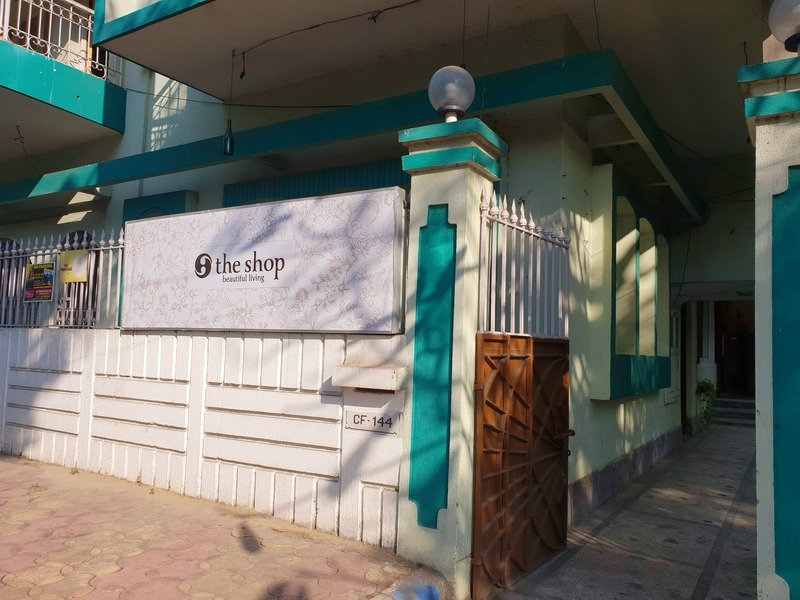 Made entirely in cotton (and a few in organic silks), their clothes range includes stylish tops to chic dresses, pretty skirts, comfy kimonos, block-printed sarees, men's smart shorts, trim shirts, neat little baby suits and a lot more. Accessorize your look with their scarves and stoles or with their colourful jhola bags. Bright colourful florals and folk motifs of birds and fish are their signature prints that are hand block printed or screen printed on several of their items. You'll also find here fabulously beautiful home furnishings in the softest cotton to gorgeous silks. Bed spreads to duvets, cushion covers and even runners. Compliment this look with the tastefully done tableware and you'll have a casa to inspire envy in others. The handmade soaps are the other thing that we fell in love with. Available in a variety of fragrances like almond rose, patchouli, aloe lavender, lemongrass and others, these will keep you sniffing like a rat for good! Clothes and scarves start at INR 600 here. Tableware starts at INR 500 and home furnishings at INR 700. The soaps are the most reasonable items here and start at INR 190. You'll also find handstitched cloth-bound notebooks in the store that are priced at INR 350. Remember check them out at the Kolkata Kettle fashion edit.